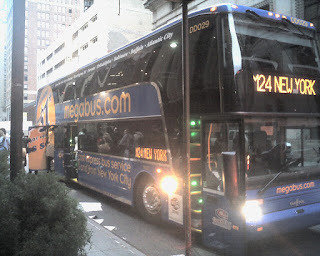 So if the MegaBus experience back to Buffalo is as good as it was on the way to NYC, I'll definately take it again. I'm in the very front seat of the double-decker bus, so the view is spectacular. NYC was a great experience as always. I love this city ... But in small doses. I could never live here. The conference went well ... And you'll definately hear some of the potential guests I met on air soon ... Some as soon as this coming week. Some of the guest pitches were great ... And some were bad. But the good more than makes up for the bad. After the conference, I had lunch at Chipotle (see photo from earlier post). I really wish we had these in WNY. I'd be a regular. From Chipotle, I jumped the subway to the Bronx to see Yankee stadium. Overall, it was just a stadium, but I'm glad I saw it before they tore it down. More Yankee Stadium pix when I return to Lockport. Then Toys R Us (photo in earlier post with more to come) and then this McDonalds I had heard about on the Travel Channel, I think. It was decadent. My final destination was Harrington's bar where I watched some of the Rangers/Pens game. Harrington's is right next to MSG so it's a great place to watch a Rangers game. I decided, however, to root for the Pens ... Becuase my good friend Al is in Pittsburgh with his son, who is there for a medical procedure ... So he thought a Penguins win might bring some good Karma. With that in mind, I close this with something I may never say again ... "Go Penguins."